While talking about the Democratic National Committee hack during the first presidential debate, Donald Trump fat-shamed, counting a 400-pound person sitting on their bed as among the suspected hackers. "It could be someone sitting on their bed who weighs 400 pounds," he said, inexplicably introducing another possibility as one of America's cyber enemies, along with Russia, China, and ISIS. If anyone thought that after months of startling statements, Trump could not shock anyone anymore, they were wrong. Many people were taken by surprise — and confusion — by his comment, and expressed just as much on social media. But it wasn't a remark that Trump pulled from the air while at the debate; in fact, he first floated the idea of a "400-pound person" as the DNC hacker back in July. At a rally in Scranton, Pennsylvania, Trump mocked rumors that Russia hacked the DNC to boost his presidential campaign. He singled out Bobby Mook, Hillary Clinton's campaign manager who claimed that Russian state actors broke into the DNC servers, stole emails, and released it to help Trump. "Probably it was China or somebody else," Trump said of the hackers. "Might be a 400-pound person sitting in bed. K? Might be. Some of the greatest hackers of all time." 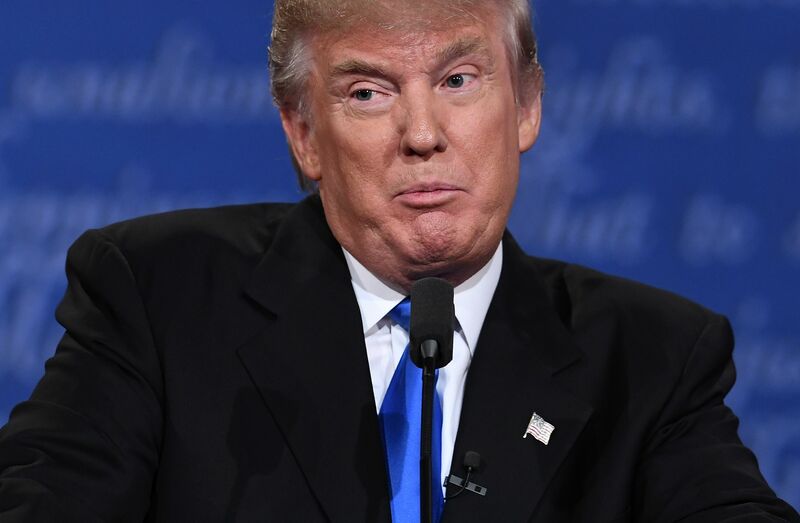 While that fat-shaming comment in Scranton was overshadowed by him saying he wish he "had that power" over Russia to hack the DNC, it didn't go unnoticed at the debate. Trump has said awful things about people's appearances before, with women being his primary targets. At one point during the Republican primary, he shamed the way John Kasich ate on the campaign trail, saying that he's "never seen a human being eat in such a disgusting fashion." And his latest flippant statement about a 400-pound person sitting in bed hacking the DNC servers only buttressed all his worst qualities, both as a presidential candidate and a person. It's a pattern of behavior that has emerged glaringly over the course of the election: Trump has a penchant for stereotyping, for knocking the marginalized, for making rude, dangerous remarks and then dismissing it as an attempt at humor. At the risk of coming off as explicitly pro-Clinton, her campaign is absolutely right — "a man you can bait with a tweet is not a man we can trust with nuclear weapons." Trump might have coasted on by this election despite his habit of resorting to insults ad schoolyard taunts, but it's highly unlikely that he will find that kind of leeway on the world stage.